Moonrise Kingdom’s heartfelt search and rescue of a feel-good result provides a perfect, even musical counterpoint to its regimented summer camp. 94 min. Focus Features. Director: Wes Anderson. Cast: Bill Murray, Frances McDormand, Edward Norton, Bruce Willis, Jason Schwartzman, Harvey Keitel, Bob Balaban. For well over a decade, writer-director Wes Anderson has faced criticism of his films being fussily repetitive. Though his new film Moonrise Kingdom is nothing if not fussy, it’s Anderson’s freshest, breeziest work since the high-water mark of 1998’s Rushmore. Moonrise Kingdom tells of a pair of troubled and gifted twelve-year-olds who, in 1965, elope into the wild of New Penzance Island (a fictional New England setting). Orphan and “Khaki Scout” Sam Shakusky (Jared Gilman) ditches his troop and meets up with fellow runaway Suzy Bishop (Kara Hayward), who can no longer stand claustrophobic life with father (Bill Murray) and mother (Frances McDormand). The Bishops’ frayed marriage retains a certain coziness—both lawyers, they call each other “counselor”—but McDormand’s Laura is carrying on with local policeman Captain Sharp (Bruce Willis). Sharp teams up with Scout Master Randy Ward (Edward Norton) to coordinate the search and rescue effort, complicated by a coming storm and the equally threatening promised arrival of the embodiment of Social Services (Tilda Swinton in fearful mode). Other than Anderson’s own oeuvre, Moonrise Kingdom best recalls Harold and Maude as an offbeat romance of two plain-spoken lovers against the world. (He: “I’m on your side.” She: “I know.”) Anderson contrasts the simplicity of young love with the adults’ insistence of complicating everything. “We’re in love,” says Suzy. “We just want to be together. What’s wrong with that?” Admittedly, the friendless children have shown violent tendencies, but they pacify each other, as long as no one’s trying to keep them apart. The script by Anderson and Roman Coppola allows none of the plot elements to spin out of control, and the director keeps it short and sweet. The ’60s setting lends itself to Anderson’s obsessiveness of detail (from Sam’s coonskin cap and corncob pipe to Suzy’s collection of purloined library books), and there’s plenty of amusement in the movements of the well-armed Troop 55, who eventually make their way to the Regional Hullaballoo at Fort Lebanon (finding there Jason Schwartzman and Harvey Keitel). The joyless scouts and melancholy adults—in, pardon the pun, uniformly pleasing performances—learn to ditch their impassivity and embrace the life spirit of Sam and Suzy. Anderson gets in the spirit as well. Stealing from his childhood memories, he incorporates a production of Benjamin Britten’s Noye’s Fludde to complement the film’s form (fugue) and function (weathering a literal and figurative storm). The soundtrack also playfully incorporates Britten’s The Young Person’s Guide to the Orchestra (stick around for the credits) as well as lonesome Hank Williams tunes to accompany the adults. So if Anderson’s carefully regulated compositions and dollhouse-styled production design send you climbing up the walls, keep your distance. But this time, the filmmaker isn’t too clever by half: he’s just clever enough. And Moonrise Kingdom’s heartfelt search and rescue of a feel-good result provides a perfect, even musical counterpoint to its regimented summer camp. 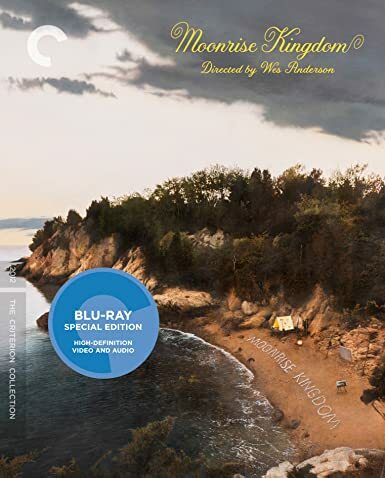 Criterion again reminds us they're in the Wes Anderson business with their latest special edition Blu-ray of an Anderson title, in this case Moonrise Kingdom. This title has appeared on Blu-ray before, in a nearly bare-bones release from Universal. But Criterion's disc adds a wealth of bonus content, including an audio commentary (including Bill Murray! ), making-of featurettes, liner notes, and a map of New Penzance. A/V specs are unsurprisingly outstanding in presenting the film according to the filmmaker's wishes. The Super 16mm image is naturally soft and pleasingly filmic (textured with grain and as much detail as can be wrung from Super 16), and the transfer beautifully renders the intended color scheme of rich washes, anchored by a deep black level (the transfer is also indistinguishable from Universal's previous HD transfer). The DTS-HD Master Audio 5.1 surround mix likewise maximizes the original elements, excelling most in the area of music. Bonus features kick off with an audio commentary featuring director/co-writer Wes Anderson; actors Bill Murray, Edward Norton, Jason Schwartzman; and co-writer Roman Coppola. The section entitled The Making of Moonrise Kingdom includes several extras, beginning with "Exploring the Set" (17:11, HD). Martin Scali, Anderson's assistant on Fantastic Mr. Fox, shot over 55 hours of the sets erected in Newport, Rhode Island; in this seventeen-minute boildown, we get valuable special-access footage of the crew and actors at work in interiors and at exteriors. "Storyboard Animatics and Narrator Tests" (8:39, HD) include "Opening Sequence," "Church Flashback," "The Island of New Penzance," and "The Island of St. Jack Wood." A reel of "Auditions" (4:34, HD) includes the tapes of Kara Hayward, Jared Gilman, Lucas Hedges, Rob Campbell, Tommy Nelson, Andreas Sheikh, L.J. Foley, Gabriel Rush, Charlie Kilgore, Chandler Frantz, and Seamus Davey-Fitzpatrick, while "Miniatures" (1:38, HD) shows how the flash flood was filmed. "Welcome to New Penzance" (4:01, HD) is a quirky promo, as is "Set Tour with Bill Murray" (2:59, HD). The former is hosted by a costumed Bob Balaban, and the latter by the mercurial Murray. "Benjamin Britten's 'Noye's Fludde'" (1:53, HD) sets the music to still photography of a rehearsal of the original 1958 production of the Chester Miracle Play. "Eleven iPhone videos by Edward Norton" (20:48, HD) come with an "Intro" by the filmmaker. "Animated Books" (4:14, HD), introduced by Balaban, and "Cousin Ben" (2:03, HD), starring Jason Schwartzman in character, constitute two more promotional films. In the first, we get readings, by Suzy, from her favorite books, accompanied by animations. In the second, Schwartzman's scout leader hosts a camp screening of Moonrise Kingdom. Rounding out the disc is the film's "Trailer" (1:52, HD), and the disc case includes a booklet with credits, tech specs, liner notes by critic Geoffrey O’Brien, and a selection of commentary from young writers, along with a map of New Penzance Island and other ephemera. All site content © 2000-2019 Peter Canavese. Page generated at 04/19/2019 02:35:25AM.